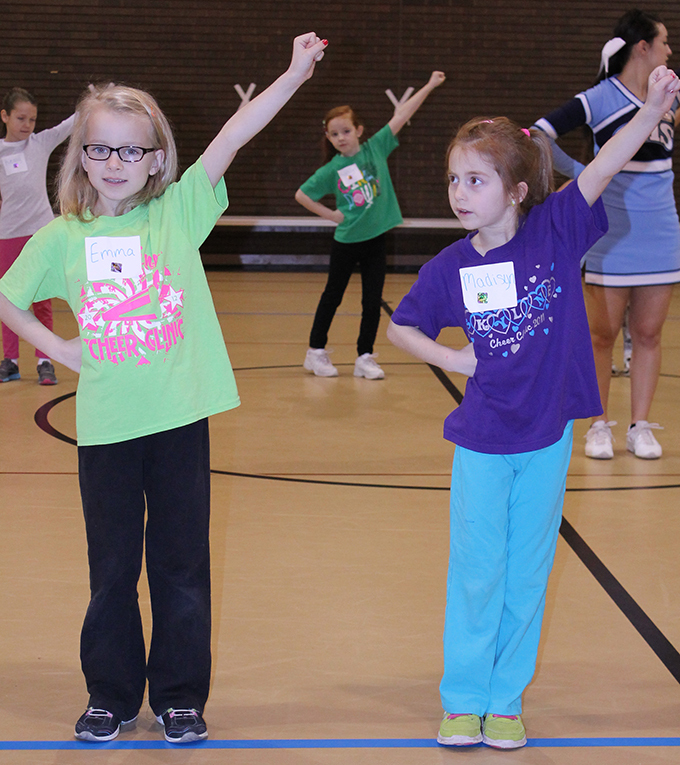 The Skyline cheerleaders taught the younger girls basic moves for cheer last week at the annual Cheer Clinic. “You get to have more bonding time with the little kids and show them your leadership,” junior cheerleader Tiffany Timm said. There were 45 girls that participated in Cheer Clinic. The little girls performed everything that the cheerleaders taught them during homecoming. They learned a cheer, sideline and a dance. The cheerleaders also taught them some jumps and different cheer motions. This year the cheerleaders did something different. The girls spent an hour and a half on Saturday and taught them the sideline and the dance. “It went smoother this way and it made the kids go home and practice more,” Timm said. Because of the snow days they didn’t get together Wednesday, so they met Thursday after school. The day started with snacks, then they got in their groups and began learning the cheer. “The older girls need to be challenged more and they learn faster,” Lee said. “It was really exciting to learn the ‘Hey Song,’,” fourth grader Riley Thompson said. Once they learned the cheer and the song, everyone gathered in the little gym and performed it for their parents. The girls performed in front of everyone at the homecoming assembly and they also performed at halftime of the boys’ game that night.